On May 16, 2007, at 7:00 PM, the Ride of Silence will begin in North America and roll across the globe. Cyclists will take to the roads in a silent procession to honor cyclists who have been killed or injured while cycling on public roadways. Although cyclists have a legal right to share the road with motorists, the motoring public often isn’t aware of these rights, and sometimes not aware of the cyclists themselves. Thanks to Dan for letting me know about this. It’s probably too late to organise anything big for Darlington, but would anyone be interested in a Ride of Silence through Darlington next Wednesday evening? Please email or comment here of you’re interested. Slightly old news, but i thought it might be of interest. 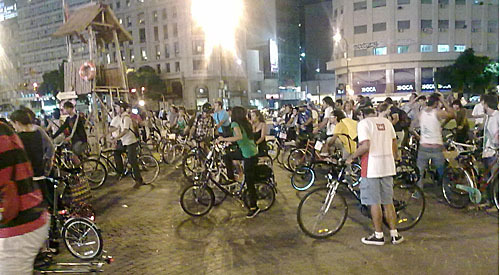 Around 30 people took part in this month’s Critical Mass bike ride on Friday, the second since regular rides restarted. For the first time, a group met on campus before the ride, to cycle in together. There was no Police presence and everyone enjoyed themselves.